I'm sometimes ashamed to walk through Edinburgh's graveyards because of the state of disrepair into which they have fallen over the past few years. When I first moved to Edinburgh in 2000, I used to enjoy spending a quiet Sunday afternoon in one of the city centre graveyards, they were a quiet, peaceful, clean and private oasis to sit in and enjoy the sun away from the hustle and bustle of the surrounding city. I liked them so much I even got a job as a tour guide on the City of the Dead Haunted Graveyard tours. Over the past five years or so, though, many of the cemeteries have been vandalised beyond recognition. On one evening last year, £10,000 of damage was done to Greyfriars' and the Canongate cemeteries by a gang knocking over and smashing many ancient and irreplaceable graves. Over a year later, the broken headstones are still scattered around. Many fragile sandstone graves have been desecrated with graffiti sprayed and scratched into them. But it's not just vandals destroying our heritage. Today I saw a tour guide from another tour company happily standing on one of the cast iron mort-safes in Greyfriars' Kirkyard, seemingly oblivious to the fact that it was bending and creaking under her weight. Unless people start respecting the graveyards, we will end up with nothing left worth saving. The wet Scottish weather has also unfortunately taken its toll on the sandstone graves many of which have swollen and shattered due to frost over winter, and much of the intricate carving is now lost forever. The Martyrs' Monument was recently restored and looks fantastic, this was money well spent by Edinburgh Council and I think it's time some the rest of the monuments are preserved before they are lost forever. 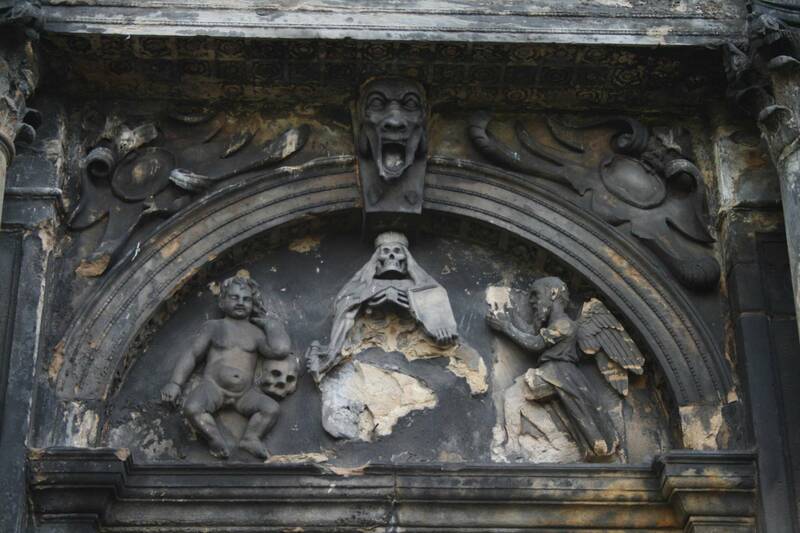 The gates to Greyfriars' Kirkyard used to be locked at night, but now they are open 24 hours and frequented by lots of strange people. A recent tour was disrupted by two old, homeless men who had built themselves a large bonfire and one of them set his clothes alight. 'Neds' often shout abuse at tourists and I've had to call the police on a number of occasions to move on large groups of drunks lurking at the back of the grave yard and hurling expletives at tour groups. Edinburgh Council have quietly condoned this 'alternative' use of the graveyards by helpfully providing a 'sharps bin' inside one of the mausoleum in the Canongate cemetary, is this really an acceptable alternative to doing something about Edinburgh's drug problem? It hasn't ended the necessity for visitors to tentatively tip-toe through the syringes littering the grass. Graves once sacred to the memory of Edinburgh's citizens are now ugly 'shooting galleries'. Isn't it time we started taking some pride in the beautiful funereal architecture we have in Edinburgh before it, too, is destroyed? phil: Its a total disgrace, no one cares about graves anymore, if i was rich i'd pay a group of people to stand up/re-sement/ fix /clean every grave stone in edinburgh, and pay the concil for staff to look after the graveyards, i would hate someone to come along and reck mine, i'd hont them and set they'r cloths on fire when they'r still waring them.